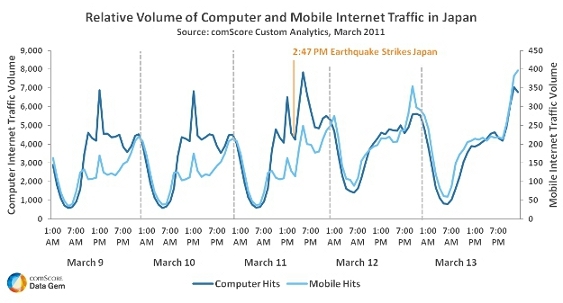 Internet traffic on mobile devices in Japan increased hugely in the aftermath of last week’s earthquake and tsunami, digital data monitor ComScore reports. Astonishingly, with landlines and broadband internet connections down, logging onto social networking sites via mobile internet was many people’s only means of confirming their safety to friends and family. 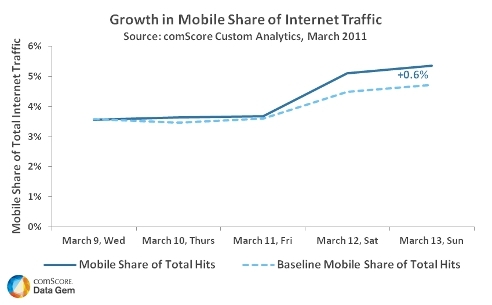 ComScore reported that the rise was particularly significant in comparison to internet traffic from computers, and that the surge continued for two days after the initial quake. Japan has one of the highest rates of mobile data consumption worldwide, with 75% of mobile phone users consuming media via their phone.